I thought I would give a general update on the farm for everyone today. Lola the pig and I have come to an understanding, which is Lola isn’t allowed to taste me or eat me when I go into her enclosure and I will continue to feed her. Instead of charging me and trying to taste me she now will stand on the other side of her pen while I feed her and change her water. I know this is progress but I still wish she was a little friendlier but then again she is intended to be a christmas ham so if it makes her happy to dream about eating the human then I guess that is fine too. The chickens are getting big and look less like tiny dinosaurs and more like chickens that may lay me eggs soon. Purdy has settled in very nicely to her pasture and takes her job of sheep guardian very seriously unless one of them is trying to eat her grain then she will tell them not to kindly she likes her space at mealtimes. The sheep are wonderful and amazing and I love them. I think that the sheep have to be one of my favorite parts of my farm so far. I have to admit that I do have a favorite sheep and most surprisingly it isn’t Ewestace. Purl one of our Lincoln Longwools has the sweetest disposition she comes over every time that I am in the pasture to get head and back scratches and to check if I brought her any goodies (which I usually do). The house is coming together and my upstairs carpets still smell amazing. We are almost finished moving upstairs which means I just have to start unpacking the last of the boxes we have into the downstairs bedroom. Oh and lastly in investigating our water situation for animals it has been decided that we are going to have to dig a new well. I am not overly excited about this prospect not only because it sounds expensive but it will stress out the animals (and me) but I am glad that soon we will have plenty of water for everyone. I went to pick up our pig yesterday, we named her Lola. She is an Old Spot Yorkshire cross that we plan to grow out for ourselves to eat. I might not have planned my trip the best since the crate I grabbed didn’t have a door on it so I had to use a bag of shavings to block the entrance. I also should have taken the truck so that the stinky pig would have been in the back instead of right behind my seat. I have to say that Lola was not to happy about being snatched from her pigpen and placed in a new pigpen. She has yet to give me any hope we might be friends as she charges the fence everytime I go out there. I am sure that she will warm up to us in time but until then I will continue to not get in her pigpen! We have been at the farm just over a week now and still love it! My mom left yesterday to go back home to Oklahoma and we are so grateful for all the things she helped us do. Everything that we moved here has been unpacked, however we still have things at my in-laws house as well as storage. 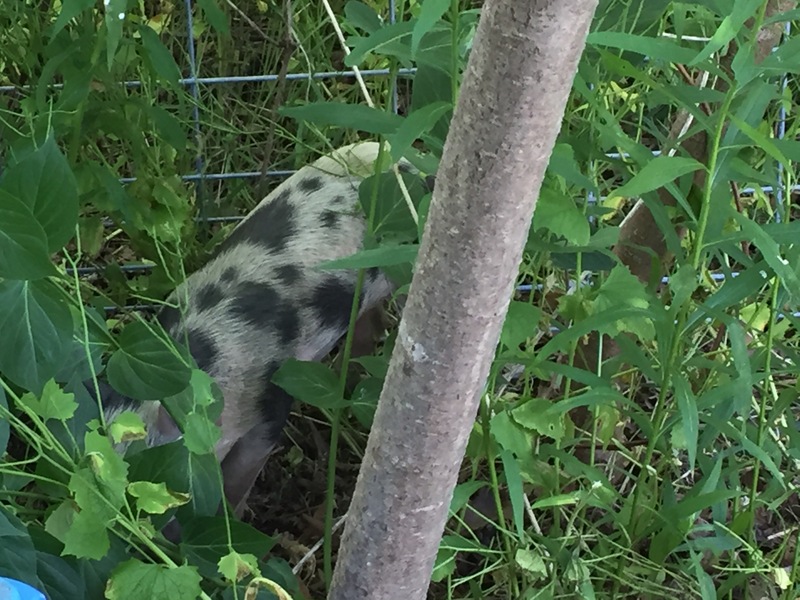 I am going to pick up our first piglet tomorow her little pigpen is all set up behind the house until she gets big enough that I won’t have to worry about her getting eaten by something down in the pasture. I have discovered that predators are a serious problem here. That has led Jeff and I to decide that we will be getting a livestock guardian. You may think 4 dogs is too many and so do we that is why we are getting a llama instead! Thats right the person who said they would never get a llama (that’s me not my husband) is getting a llama. This was prompted by the incredibly sad news this week that my favorite bottle lamb Lamb Chop got eaten this week by a coyote in broad daylight! As you can imagine this upset me deeply and the idea of my lambs getting picked off one by one has prompted me to get my sheep their own security detail. Look forward to updates on the arrival of by far the goofiest looking creature we have gotten. Annabelle and Dixie are both due to kindle mid week next week and have both enthusiastically built amazing nest (they are both early nesters). I find if I give my girls their boxes a little early they seem to be more relaxed and less frantic closer to their kindling date (this is not the case for all rabbits). I will keep everyone posted when they have their babies! Lastly my pasture is coming together, my mom and I cleared a path to the pasture so that we can see it from the house. My mom ran the weed whacker like a maniac bent on murder while I lopped off sumac trees. My oh so wonderful neighbor is meanwhile cutting the shoulder tall grass to a more manageable hight of shin high. Jeff and I plan to put of fencing and shelter for the sheep this weekend so that I can bring home some of my sheep including my last bottle lamb Ewestace. Thats all I have for updates I will post pictures tomorrow of the little piglet. I have been making soap for our home for about a year now, today I tried a new recipe. I used almond milk instead of water, we will see how this turns out in about 4-6 weeks. For those of you who have never made soap this is how I do it (I am not a soap expert but it gets us clean). First I measure out all the ingredients by weight in plastic cups. The next step is to mix the lye with the water or milk. I used and ice water bath to keep the lye mix from heating up to much so that I can add it to the oils. After lye is mixed set aside and melt solid oils in a pot. Once the lye and the oils reach between 90-110 degrees you mix them together. I use a hand mixer to mix the soap, the soap is mixed until it reaches what is called “trace” which is like runny pudding. At the trace point you add essential oils and colorants (I added vanilla oil and calendula petals to this soap). At this point you place the liquid soap into the mold (grease the mold with oil to help release the soap later I used coconut oil). I added some extra flower petals on the top to make it pretty. We have been busy planning farm things like fences, barns, goats and chickens. The middle of June seems far to long to wait to move. I decided in the meantime to make an egg basket while I wait. 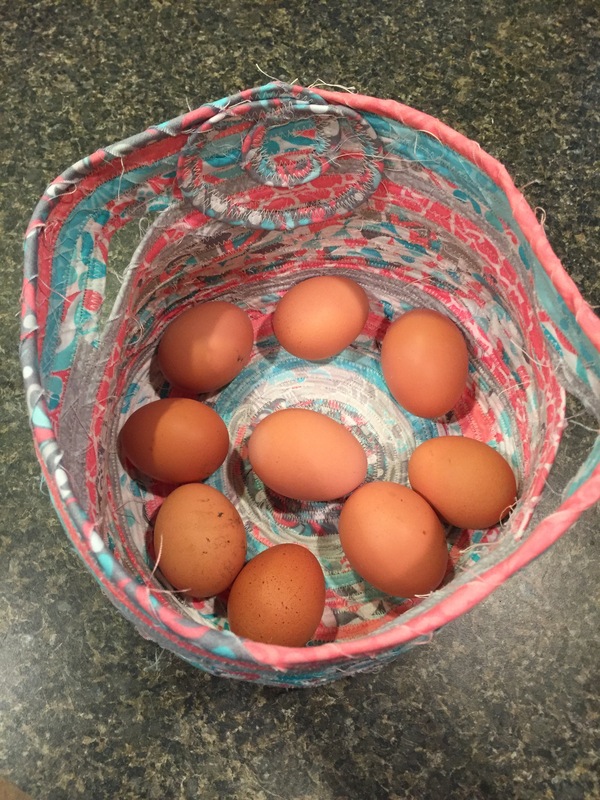 This basket turned out much larger than anticipated, meaning I will need many chickens to fill this basket. We are so excited for this new chapter in our lives!